If you need a new computer or need to replace your old hard drive, you may sometimes find it difficult to copy all the files. It may happen due to poor disc properties which have become obsolete over the period of time or some hardware disc read/write issue. Most of the time people recommend fresh setup on new machines, but may not work well for everyone. I myself used to clone entire old 260Gb Gigabyte disc with New 1TB same make. It can be done quickly and does not require much attention on what software missed and what drivers to update again and again. With these softwares, you can stay 100% assured about your work and data all the time. It is one of the best-chosen methods by many and works great most of the time. Head to a forum for software installation guides. Connect both hard drives to a computer. Install Macrium Reflect Free and run it. It will display all the drives available. Select the drive you want to copy. Keep partition size to maximum, as you don't have to worry about the remaining size of your new disc to format again. Within around 1/2 hour, It must complete the process if everything goes well. To ensure the copy has done, you well know what to do. Just boot using the newly copied disc and see if starts with windows properly. Download Macrium Reflect Free here. Make sure to take maximum backup using USB etc. to make sure you won't lose your data if something goes wrong in mirroring process. Again, ease is quite user-friendly and has fast copying tools. Not only hard drive, you can even mirror your Android phone with this super utility. Easeus is great for taking both files as well as a system (partition) backup. 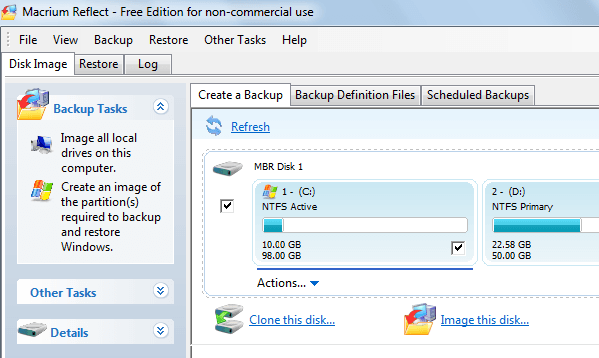 It has lot of recovery and restore options inbuilt with easy just select and clone tabs for your disc mirroring. The entire process is extremely easy and does not require any software knowledge. It is yet another tool which is great for copying entire disc. When it comes to software and drivers, this tools has an edge. It is more suitable for those complex programmers and IT people where your PC may require many drivers and applications installed. Similar tools include ShadowCopy, Clonezilla is again great options to choose from. If you are using Linux-based computer systems, you may go for similar to windows option which is 'RAID 1 Mirroring'. You may need some 'mdadam' software package knowledge.